What a surprise I just got by reading the news , just now : Albert Jacquard died yesterday . The geneticist and leftist Albert Jacquard died Wednesday , September 11 at his home in Paris (sixth district) at the age of 87 years , according to his son . The polytechnic , born December 23, 1925 , which was to honor the association Right to Housing ( DAL ) President , was swept away by a form of leukemia , he said . Coming from a family of good society Lyon , Albert Jacquard is received Polytechnique 20 years later in 1951 and between Seita ( national company that manufactures tobacco and matches ) to work on the establishment of an early computer systems. After a brief stint at the Ministry of Public Health , he joined the National Institute of Demographic Studies (INED ) in 1962. But approaching forty and » realize that we are not eternal and we do not want to spoil his life at ridiculous things. 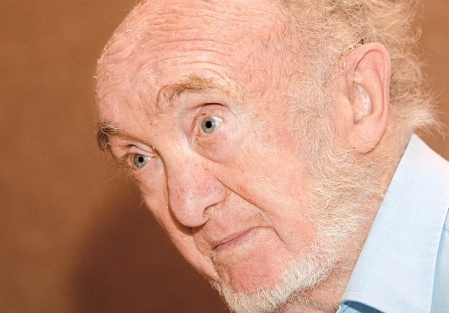 » Albert Jacquard then went to study population genetics in the prestigious American University of Stanford, then returns to the INED and spent two doctorates in genetics and human biology in stride. In addition to teaching and his expert to the World Health Organization (WHO) work , it will then cease to remove the supposedly scientific racist theories and arguments will witness even in 1987 at the trial of Nazi Klaus Barbie for crimes against humanity. His first books , such as » Praise the difference : genetics and man » (1978) meet a great success that will not fail , even when drift towards philosophy, popular science or anti- liberal humanism . His commitment Pr Jacquard dislikes liberalism and it will also parliamentary candidate in Paris in 1986, sustained by various movements of the alternative left , then in 1999 the environmentalist list list led by Daniel Cohn- Bendit ( in 84th position). In the 1990s , Albert Jacquard will put its media verve serving another cause : the inadequately housed and undocumented . Occupation of a Dragon Street building in 1994 , the Church of St. Bernard in 1996 … his face old Greek fauna quickly becomes as familiar as that of the Abbé Pierre , Gaillot or Emmanuelle Béart , his comrades . Age assisting, honorary president of the LAD had been more discreet while continuing to support the poor and pushing rants , as in his daily column on France Culture from 2001 to 2010. He ‘s been a man of the left , it does not detract from the man he was throughout his valeur.C is a noble man who fought for noble causes. I think his fight continues even after his death. Also , I will continue to inspire me with his ideas. When I listen to his videos or when I read it, I feel more human, more open and compassionate to my fellow men . He may have exceeded 80 years , the French intellectual Albert Jacquard does not continue unless wearing his call for a more just and sustainable society , the only way to avoid anything less than the end of the human adventure . Le Devoir has met while he was passing through Quebec . Albert Jacquard message is clear : either humanity away from the race for eternal economic growth and continues to consider the planet’s resources as infinite , or it will face its own shipwreck in a future not so long ago . And the deep recession that hit the world should serve him as a first step in thinking about how to avoid the worst . Wide program, especially when observing the sometimes Kafkaesque complexity of large structures such as the UN or when negotiations on the Kyoto Protocol . « There is a societal choice , says Jacquard . Can we admit that human life should be summarized in the fight against the other , so-called liberalism ? Or , during a lifetime, we can try to achieve certain ideals , » such as improving the health of all , the conservation of resources and protection of the environment? » it is urgent to rethink our relationship with the dogma of the « growth ». Rest in peace big man , keep up the fight!